Hello, it's Julia again today. I made another layout for this month grid challenge. Hola, está Julia aquí de nuevo hoy. Hice otro layout para el reto cuadrícula de este mes. This time, I used a pinterest collage as a grid design for my picture. As probably some of you, I have a long pinterest board with lots of Christmas ideas to craft, but there isn't enough time to do these things. I picked some things I really want to do this month and used them as my layout photo, compared with the large number. Esta vez, utilicé un collage de pinterest como un diseño de cuadrícula para mi foto. Probablemente como muchos de vosotros, tengo un largo tablero en pinterest con muchas ideas navideñas para scrapear, pero no tengo suficiente tiempo para hacerlas. Elegí algunas cosas que realmente quería hacer este mes y las utilicé como la foto de mi layout, comparado con el número grande. In Germany we celebrate Christmas on the 24th and this is my time frame to do all these creative things. 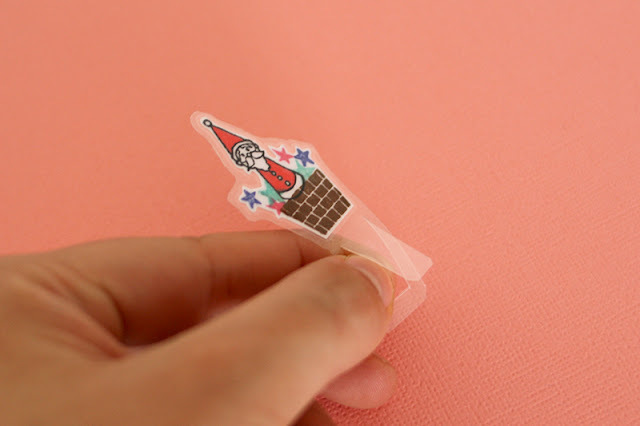 En Alemania celebramos Navidad el 24 de Diciembre y este es mi marco para hacer todas las cosas creativas. For the rest of the layout, I always liked those little ball garlands on layouts, but I hadn't used mine very much. So I decided to make a garland for this layout. And the paper with the cut out stars was a lucky find on my table from a previous layout (the layout with the star grid). 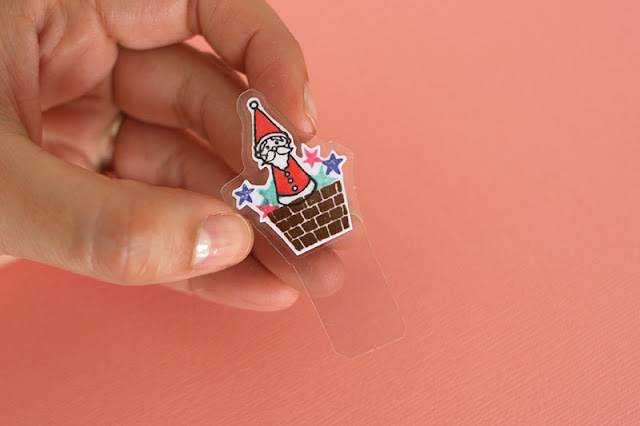 Para el resto del layout, siempre me gustaron esas pequeñas pelotitas como guirnalda en los layouts, pero nunca había utilizado mucho las mías. Así que decidí hacer una guirnalda para este layout. Y el papel con las estrellas cortadas fueron un encuentro suertudo en mi escritorio de un layout previo (el layout con el diseño de estrellas). I hope you had time to make something crafty for this beautiful time. I have a lot to do. Espero que tengáis tiempo de hacer algo creativo para esta hermosa época. Yo tengo mucho por hacer. 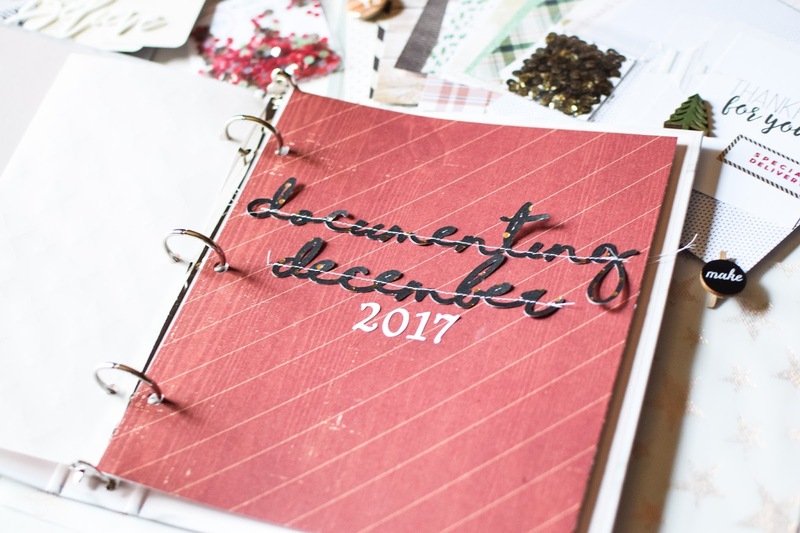 I'm excited to share what I've done to prepare for my version of December Daily *hint* it's not much ;) - Like Elise shared, I don't like feeling the pressure to have something awesome documented for every day. So my plan is a 6x8 marble patterned album filled with some page protectors and some lose pages - having fun and documenting memories! Who knows, maybe along the way I'll decide to separate by days. I had trouble finding a December kit that I really loved - so I did a little work to create my own DIY version, using mostly things I already owned. I started with a color palette and went from there. I bet you could do the same - stars, metallic colors, neutral patterned papers, shiny embellishments - all channel a pretty Holiday feel. I'll also be using some black and white because I think it's very classy and timeless. I purchased a few Christmas themed items from Target but that's it! For my title page I chose a dark red patterned sheet of paper, and a scripty font to use with my Silhouette Cameo to cut out "documenting december." I stitched it onto the red background and found some white numbers to display the year beneath. 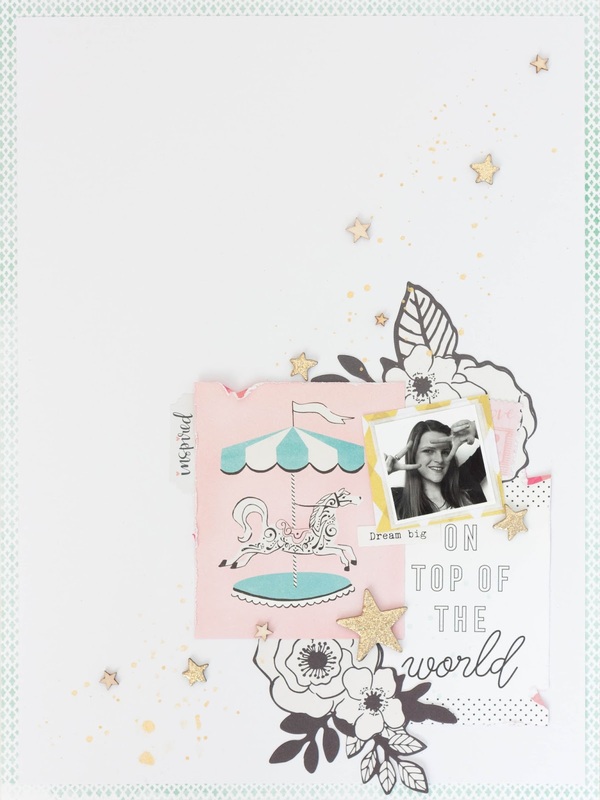 I love layering so I cut a piece of vellum from the Pink Paislee "Sweet Freedom" collection to about half the width and added it before my page. So quick and easy! I hope you are inspired and encouraged that you too can document your December memories in a short amount of time! Hello everyone! Last year I joined in on the December Daily 'hype'; documenting every day in december. 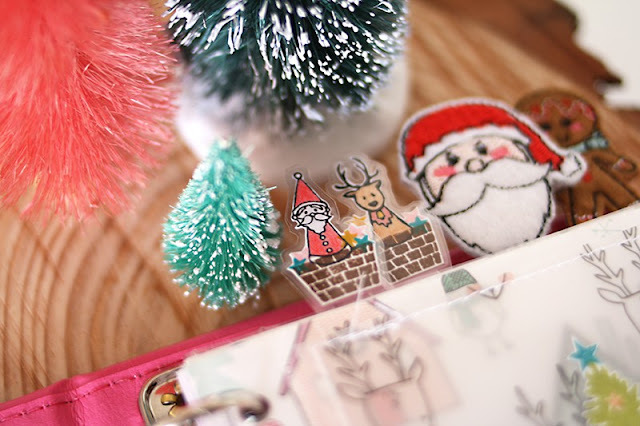 It is a project invented by Ali Edwards, to keep track of december. It's a month that goes by so quickly. I really liked to do it, but documenting every day is not possible because of work and you know.. life! This year I wanted to do something like December Daily, but simpler. I selected the papers and embellishments I wanted to use for this project. 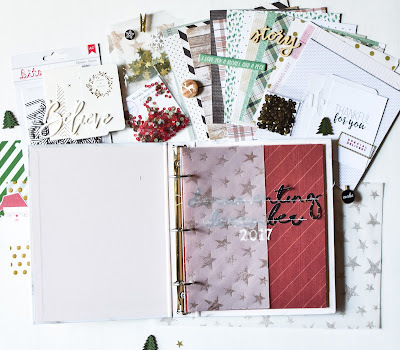 I used Crate Paper 'Snow and Cocoa' and their new Christmas collection 'Fa la la', plus some specialty papers, like vellum and white glitter paper, and Project Life pocket pages. I cut all the papers and patterns to size. I used some self made stamps on some of the papers to get a cohesive look through the album. 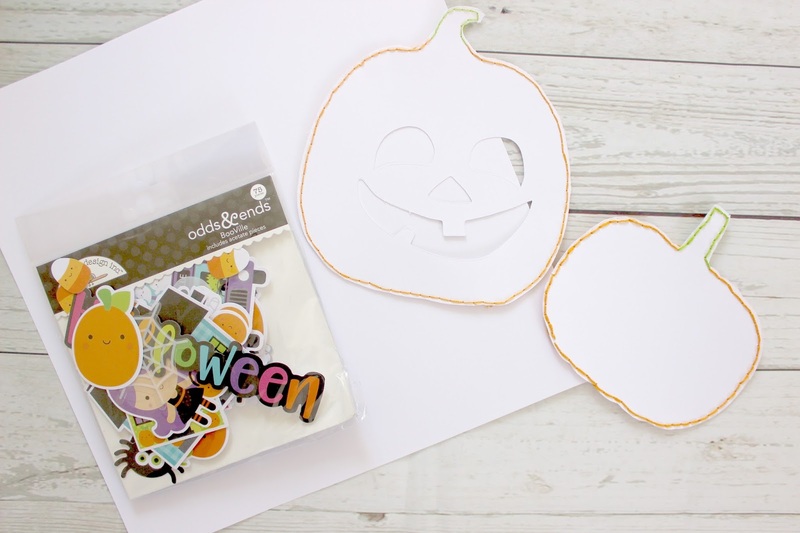 The real fun begins by decorating some of the pages with embellishments, die-cuts and stickers. 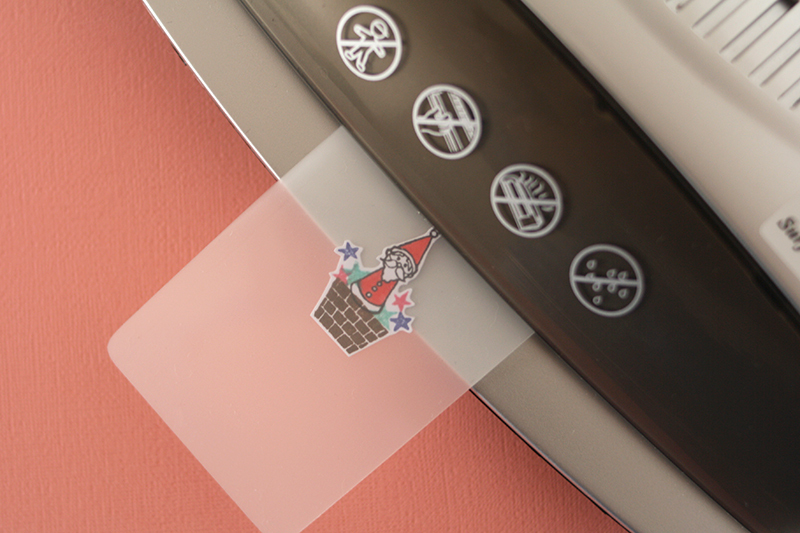 I used the die-cuts from the Crate paper Christmas collections, sticky notes banner shapes from the Carousel collection and epoxy heart stickers by Funny Sticker World. 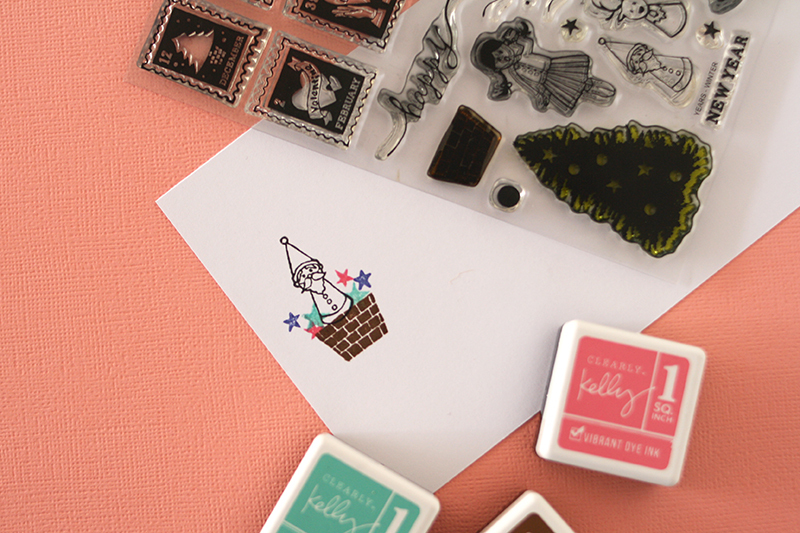 A fair warning; try not to decorate too much, because you still need space for your pictures later! These faux suede tassels I bought a long time ago, were a perfect match for decorating this mini. They were just a little too big, so I used a sharp pair of scissors to cut the tassel straight. Jewelryhooks are perfect to attach the tassels to the binder ring. 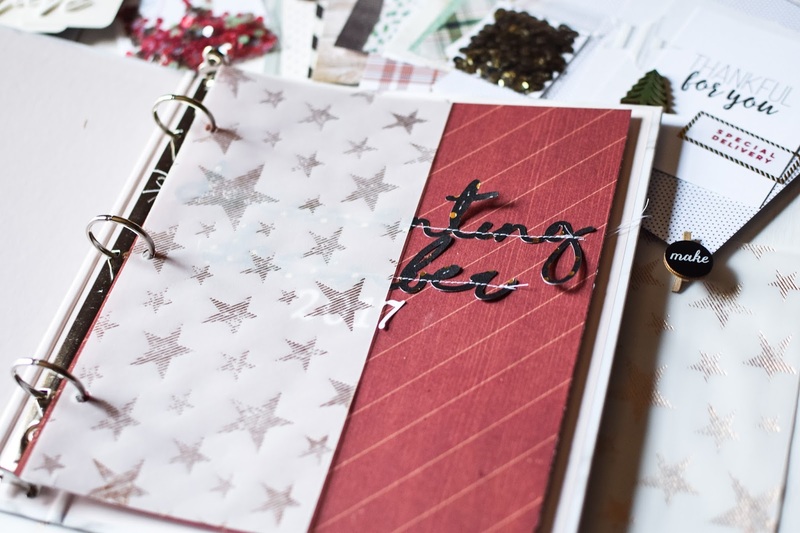 I love to use binder rings for these mini albums, because you can add tags and mix up the pages at any time you want. 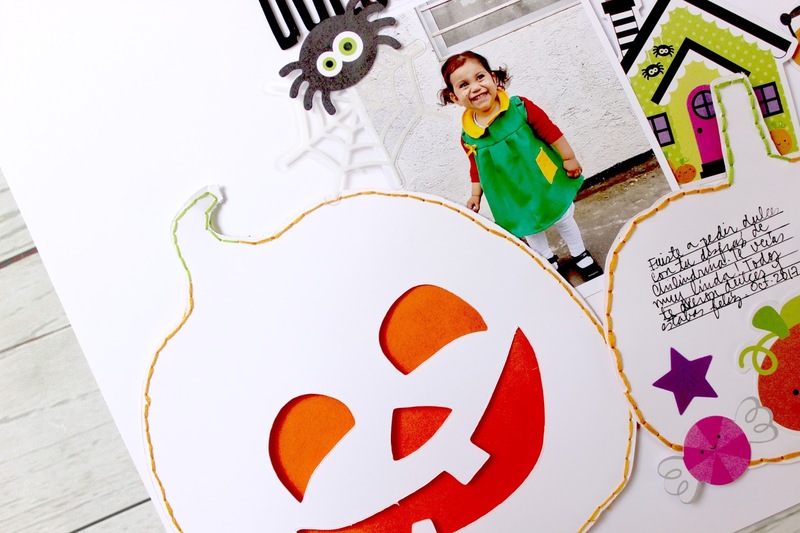 Punching shapes out of paper is a perfect way to embellish the pages. For instance; I punched out a lot of glitter hearts, and attached these through the entire mini. This way it seems like everything belongs together. Last, but not least I stitched some of the tags with red thread, for a real Christmas feel! I hope you enjoyed this tutorial. I post a flip through on my Instagram @sgrselse, if you want to see the entire album! Hola amigas de In The Scrap! Jo por aquí y hoy quiero enseñarles un Layout muy fantasmagórico y con algunos detalles bordados titulado "Dulce o Truco". Lo primero que hice fue cortar un par de calabazas para luego bordarlas. 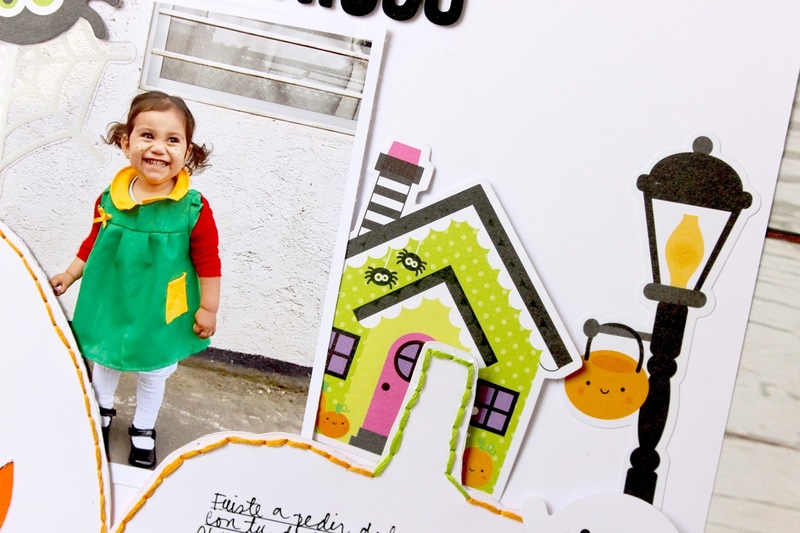 Luego elegí la fotografía y adorné con algunos die cuts de la colección "BooVille" de la marca doodlebug. Me encantan los colores de los die cuts, son muy llamativos y hacen un lindo contraste con la fotografía de mi pequeña y el papel de base blanco. Espero les haya gustado este proyecto tanto como a mi. ¡Saludos a todos! Hi, there! 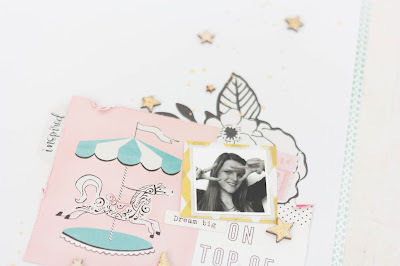 I'm very lucky to show you another layout here at In The Scrap today. Before I started I knew that I wanted to do something with a grid again, because it is still the ongoing monthly challenge. But I also wanted to do something different of course. 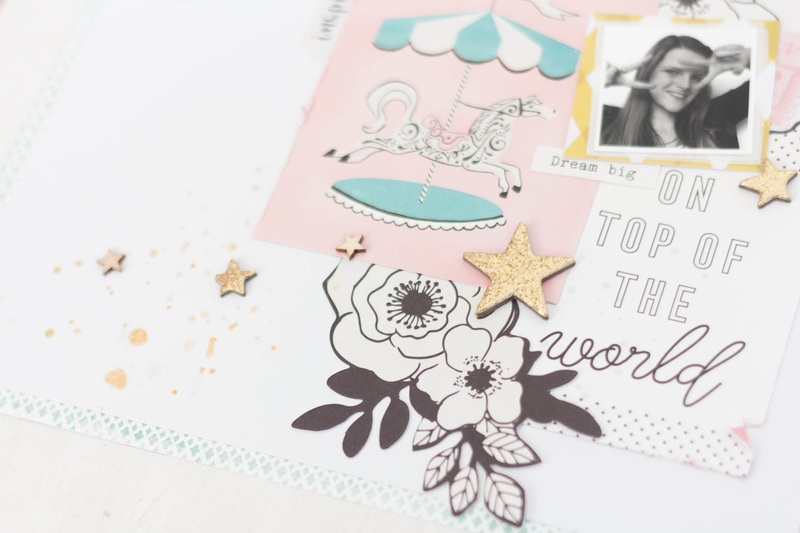 On my last layout I used paper stars to make a grid and this time I wanted to use several pictures to make a grid design. Luckily I had some pictures on my table from a recent workshop with my friend Steffi. ¡Hola! 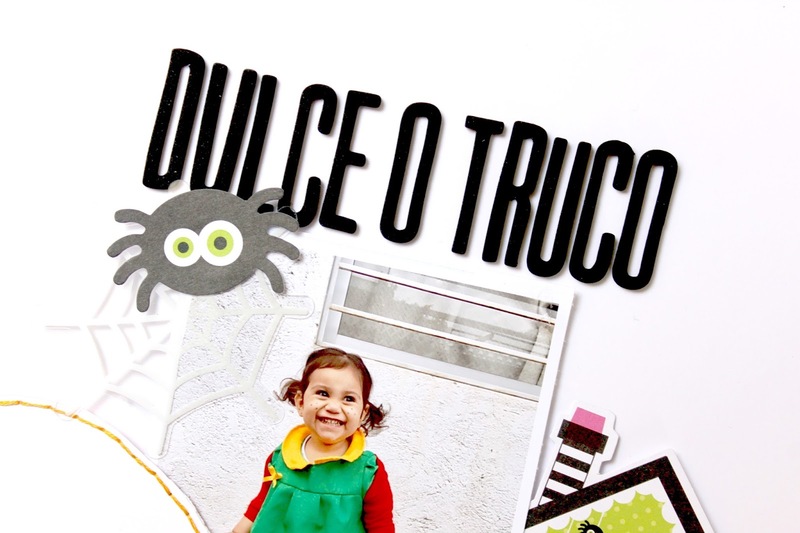 Tengo mucha suerte de enseñaros otro layout aquí en In The Scrap hoy. Antes de comenzar, sabía que quería hacer algo con una grilla de nuevo, porque sigue siendo el reto mensual en curso. Pero también quería hacer algo diferente, por supuesto. En mi último layout utilicé estrellas de papel para hacer una cuadrícula y esta vez quería usar varias imágenes para hacer un layout de cuadrícula. Afortunadamente, tenía algunas fotos en mi mesa de un taller reciente con mi amiga Steffi. This is the story to that layout. And now I'm already thinking about another grid. Esta es la historia de este layout. Y ahora ya estoy pensando en otra cuadrícula. Hola a todos! Les escribe Cari Orellana y hoy quiero mostrarles como fue que hice estos clips que usé en mi Diario de Diciembre del años pasado. Son super simples, pero quedan hermosos una vez puestos. 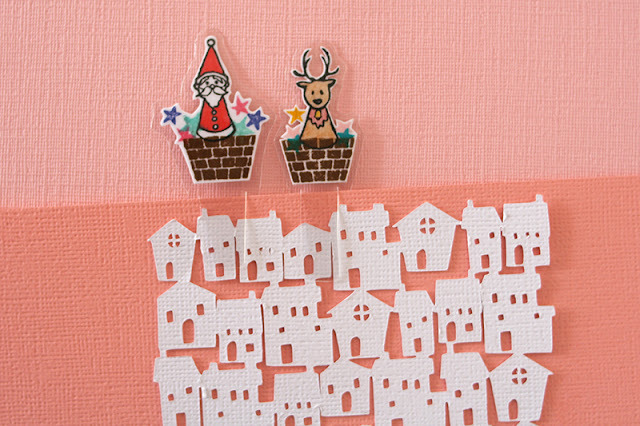 Lo primero que deben hacer es timbrar una imagen en un papel blanco, yo usé unos sellos de navidad de Sakuralala que me gustan mucho porque son muy pequeños, ideales para este tipo de detalles. Luego lo cortamos por las orillas y lo plastifican con la termolaminadora. Si no tienen una por lo menos acá en Chile hay muchas librerías que plastifican y es muy barato. Cuando ya esté plastificada cortamos una vez más nuestra imagen por la orilla menos en la parte de abajo. En esta parte dejaremos un rectángulo del largo que queramos que sea nuestro clip, unos 2 o 3 cm es suficiente. Y para terminar cortamos un nuevo rectángulo más pequeño al interior del rectángulo inicial con el cortacartón. Y eso es todo!!! Son super fáciles de hacer y pueden usar cualquier timbre que tengan en casa. 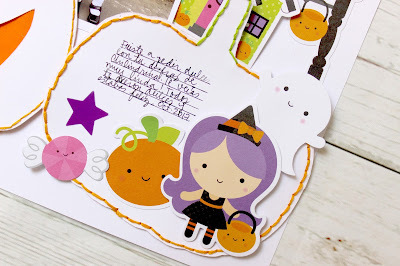 Espero que les haya gustado este tutorial y se animen a hacer algunas decoraciones caseras! Y si los hacen etiquétenme para que los pueda ver! My name is Julia, I live with my husband and my three kids in the border triangle Gerrmany, Switzerland and France. I have always made scrapbooks about trips and vacations - even before I knew that there is a hobby called scrapbooking. When my kids were born I started making a Project Life Album to document our family life. That is the most important documentation for me and my family. These days I put my layouts inside my PL Album, right where they chronologically belong. My kids love these albums and they're looked at quite often in our house. I also started doing mini albums, about vacations or other little adventures. In those books and on layouts is my place to be crafty, to get the colors out and to try new techniques. I'm looking ahead of doing more mini albums. They're such a fun to make. I'm so glad to guest design here on this beautiful site of inspiration. I always come and have a look what fun challenge is going on. I especially like to use all my collected stuff for the challenges, and just have a topic to guide me. Qué ganitas de ver vuestras creaciones. Queremos aclarar que con tantas participaciones se nos ha hecho muy difícil elegir ganador y destacadas, pero nos encanta que esto suceda y que os animéis a participar tanto. ¡Muchísimas, muchísimas gracias! Os esperamos en nuestro próximo reto con una inspiración de nuestro equipo de diseño que no os vais a querer perder.